When you sign up for telecommunications services — some combination of TV, broadband, and/or phone — you’re told you’ll pay something like $49 or $99 a month… and yet the price you actually pay can be as much as 40% again on top of that, thanks to a heap of sometimes confusing charges and fees. Which ones do you blame the government for, and which are made up by your cable company? One business at a time, we’re using real customers’ bills to break it down. We’ve covered Comcast, TWC, DirecTV, Charter, FiOS, and Uverse in our bill guide series so far. Now, it’s Dish’s turn. The below bill was provided to Consumerist by a real-life Dish customer who subscribes to a programming service tier that nominally costs $89.99 per month. The subscriber also pays for some extra premium and movie options, which definitely increase the rate. Setting aside the premium content add-ons, though, $28.57 — about 18% of their overall $157 bill — comes from some kind of additional surcharge or fee. Dish bills are, well, pretty short. Since the company only provides pay-TV service, and not internet or voice, they’re limited in scope. Dish also charges fewer fees overall than most of their competitors — a fact they tout far and wide as a major marketing tactic on their website, where they compare their own fee structure favorably against basically all the same providers (except Uverse) we’ve looked at so far. This is the quoted price for the service bundle you subscribe to. In this case, it’s the “America’s Top 250” service tier, which includes almost every English-language TV channel there is, including all of the premium networks that usually require an additional fee. Dish does all pricing based around their minimum bundle, which they advertise as “$49.99 a month plus taxes,” and the “America’s Top 250” tier package is described as a $25 / month upgrade over that. 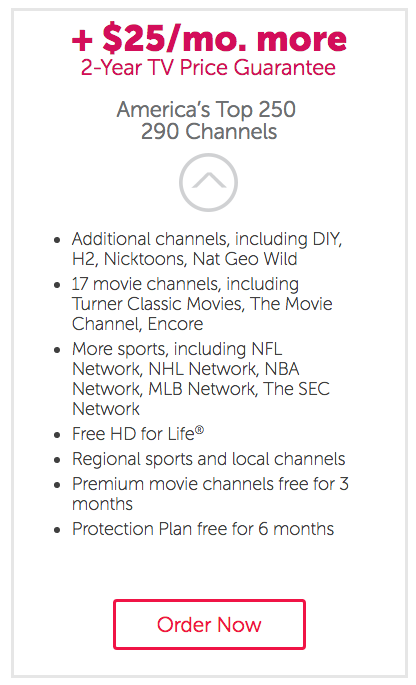 Do the math, and that’s $74.99 per month for the package, which includes basically all of the basic, standard, and extended cable channels you can think of, from the major to the niche, including a bunch of sports — but not including the premium channels (HBO, Starz, etc). This is the price you expect to pay, and the one you sign up for. Satellite service requires some kind of receiver. This is functionally your cable box, for which the FCC thinks you are paying too much. 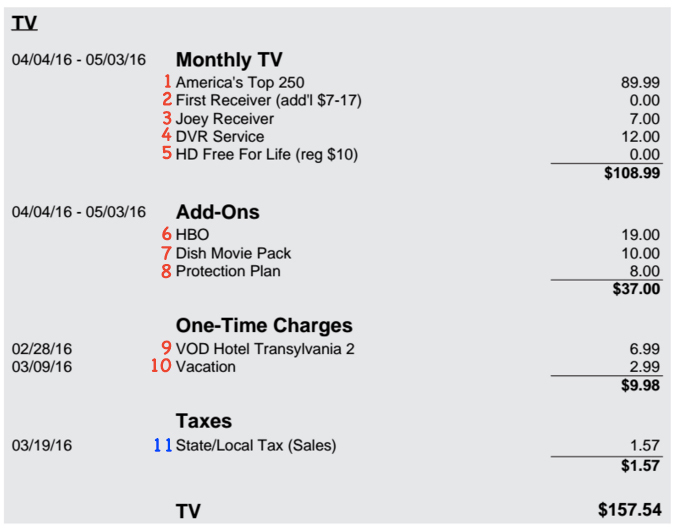 Dish makes a point of not charging for the first, primary receiver subscribers have, but they still put the $0 line item on the bill so you can feel like you’re saving money. …Dish does, however, charge for additional receivers, and this subscriber has one. The company has a kangaroo-themed naming scheme, and the “baby” receivers on second and subsequent TVs in a customer’s home are called Joeys. Dish makes clear up-front that they charge separately for their fancy-pants “Hopper” (again with the kangaroo theme) DVR service. New customers pay $10, according to Dish’s website. However, of the Dish bills we looked at, all but one were paying $12 for their DVR service. As part of the bundle this customer subscribes to, they get a “discount” on receiving HD service, zeroing the $10 fee out. However, this is somewhat misleading: HD service is always free, according to Dish’s website, on all service tiers. Who doesn’t need their Game of Thrones and Sesame Street fix, right? HBO is your classic premium channel. However Dish is currently offering their package of 9 HBO networks for $15, rather than $19, to customers who sign up for it now. The Dish movie pack gives you, well, movie channels, and lots of ’em. This particular customer has chosen to add this channel bundle to their subscription package. Dish, like its satellite competitor DirecTV, has an optional Protection Plan — equipment insurance, basically — that subscribers can opt to pay for. Basically the fee is a $96 annual bet against whether you’ll have expensive repair needs or not. The plan covers replacement equipment, replacement cables due to power surges, and reduces the fee for having a tech come out to provide service to $10. Dish automatically includes six free months of the protection plan with all of its two-year contract bundles — so most people are going to see their monthly bill suddenly jump by $8 on month seven of their “guaranteed two-year” price plan. It’s the year 2016: you rent movies by pushing a button on your remote control, instead of heading down to the local Blockbuster, because there is no local Blockbuster. This subscriber’s family enjoys movies of an evening, and paid for some content this month. Not pictured: Other one-time charges or one-time credits, like installation fees, repair fees, refunds, negotiated discounts, or similar non-recurring charges. Tax? Tax. Taxes are inevitable. Rates vary wildly depending where you live but the vast majority of jurisdictions in the U.S. impose some kind of communications and/or sales tax on pay-TV services. Googling “[state name] communications tax” should be the fastest way to find the pay-TV service tax rates in your state. Rates may also vary based on county or municipality. Additionally, some states and jurisdictions impose standard sales taxes on pay-TV or telecommunications serivces; some impose them at a different rate than on other goods, and some may not impose them at all. You’ll need to google “[state name] sales tax” to start working that one out. Dish lumps basically all state and local tax you might pay into a single line item, which is not helpful for understanding why the money is coming out, and where it goes. We’ve looked at eight different detailed Dish bills from seven different states, and the “State and local tax” line on them read anything from $0 to $9, without any state / local breakdown or further explanation. One of the eight bills did list “tax (telecommunications)” and “tax (sales)” as two different line items, but it was not the only state of the ones we received bills from that imposes telecommunications taxes — separate from sales taxes — on satellite TV. Dish does maintain a list of state / regional taxes on their website, which is a good start. However, the names given to line-items on customers’ bills do not match the names given on the website, nor is the list all-inclusive, as it leaves out several states that do also charge a tax. Not a Dish Network subscriber? Never fear! Previous installments of this series have included detailed breakdowns of bills from Comcast, Charter, Time Warner Cable, Verizon FiOS, AT&T Uverse, and DirecTV, for all your cable bill comprehension needs. Dish Offering More Flexible Pick-And-Choose Channel Packages. Is It Worth It?